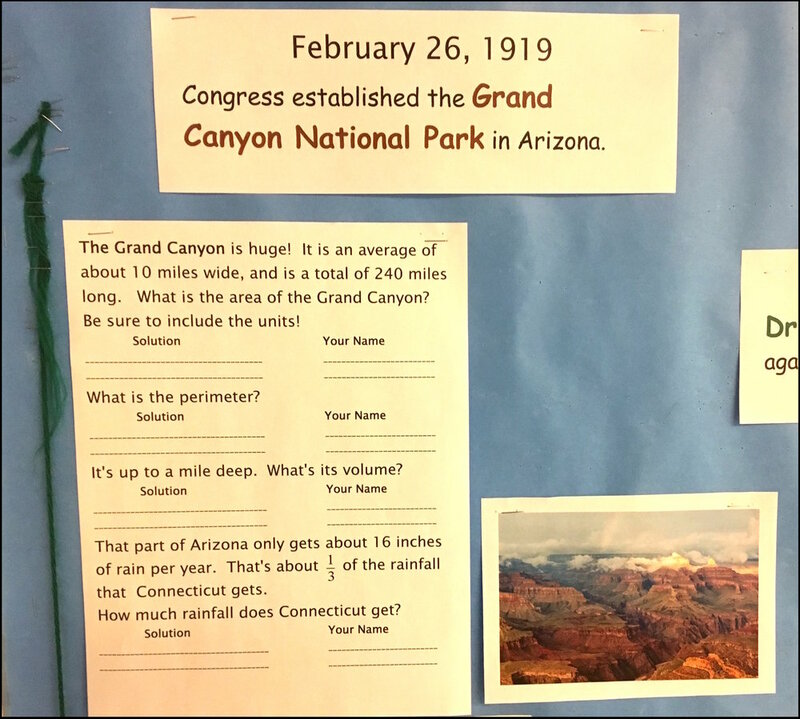 In an earlier post (1½ years earlier, to be exact) I'd written about my interactive Math bulletin board that actually gets read and used. I've since upgraded and expanded it. It's open year-round now, with a lot more questions and response from my students. They're grouped into periods of 3 months each. Thus far I have August-September-October, and February-March-April available. In each set you get 50-60 pages of problems for $5. Here are some newer pictures. Here is a quick, class- and student-friendly explanation of three different models for multi-digit, whole number multiplication. As you can see, it shows the area model, the partial products method, and the "standard" or traditional algorithm. It becomes obvious when we look at the three methods together that they simply organize the multiplications differently. Each method separates multiplication according to place value -- the value of the two digits being multiplied at any one time. The area and partial products methods make those separations explicit. They in turn help to clarify how the standard algorithm works. I have become a big fan of the area model. I like to tell students that it's a "picture of numbers." Many must agree, because lots of our fifth graders continue to use it by choice long after they have mastered other methods. I have an introduction to the area model for fourth and fifth graders in my TPT store, by the way. Download the area model explanation (PDF). This is a little advanced for my age level, but might be interesting to advanced 5th graders and Middle School students. Start with this picture of a garage in Waterbury, CT. This is the Powers of Four Garage Door, and can be used as the basis for an exploration into both powers of 4, and Base 4 numbers. When we extend it, it can also be used as the departure for exploring Base 4. This drawing demonstrates the number of squares if the front is reproduced onto all 4 sides off the building. Now imagine the owners decide they want to expand vertically. Below is the expansion of the numbers above. How would you name these numbers? The problem is that we need to assign the numbers 1, 10, 100, etc. to these groups of squares. But it doesn’t make much sense to call them “ten,” “1 hundred,” and so on, because those words have specific meanings relating to Base 10. Perhaps there needs to be another naming system. Maybe we should call them what they are – the object that they name, in other words. Let’s say that someone decided to paint the exterior of this approximate cube, and knocked off for the day after painting 1 floor, 2 sides, 3 doors, 2 rows, and 1 square. In our familiar notation, that would be 12321: 1 floor, 2 sides, 3 doors, 2 rows, and 1 square. 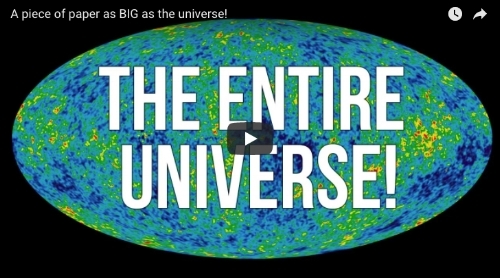 Perhaps we could name it in the same way we would name a similar number in Base 10. Could it be… 12 sides, 3 doors, 21 squares? … or, 123 doors, 21 squares? … Where would the commas go? As an elementary teacher, I'm not very familiar with teaching children to work in other bases, so I guess I'll bow out at this point. It's tough trying to teach students to count coins when they may not have much experience in handling money. Pictures on a page are notoriously imprecise. Plastic coins are better than nothing, I guess, but it still seems that students need to have handled real coins in order to recognize the plastic ones. Here's one way to give students a good visual and tactile experience of coins. The card is matting, 8-ply. It's a thick matting and often can be obtained as scraps from framing or craft shops. The text was copied several lines to a sheet of paper, cut into strips, and then cut to fit the length of the cards. Then I use clear tape to attach the strip of text to the bottom half of the card. Unfortunately it can't be laminated -- I don't know of a glue that will stick well enough to laminating material. The coins are glued to the card using 100% silicone caulking, just a large dot on the underside of each coin. You'd really have to work to pull those coins off. This gives students a chance to feel the coin as a 3-dimensional object. The best solution, of course, is to have students using real coins. I'll post my method to do that in a few days, after we're back in school. A Math bulletin board that actually gets read! Here are pictures of my hallway bulletin board. It's interactive and dynamic. It's also a little more work than most bulletin boards, which typically get installed and then forgotten until they're stale. But after the initial printing of questions and setup, it only takes a couple of minutes of daily maintenance. At Maloney all teachers are responsible for a hall bulletin board or display case space for two consecutive months. 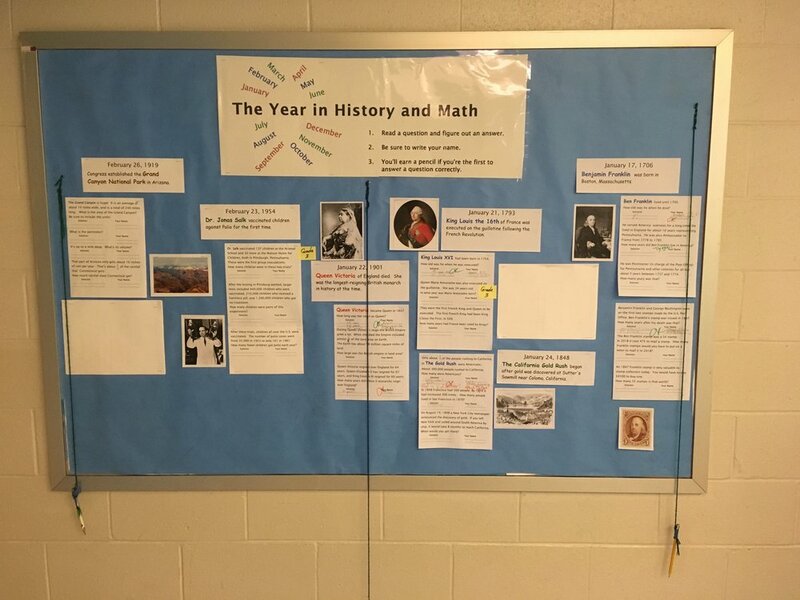 My beginning-of-year bulletin board is on August/September (and then October) in History and Current Events. 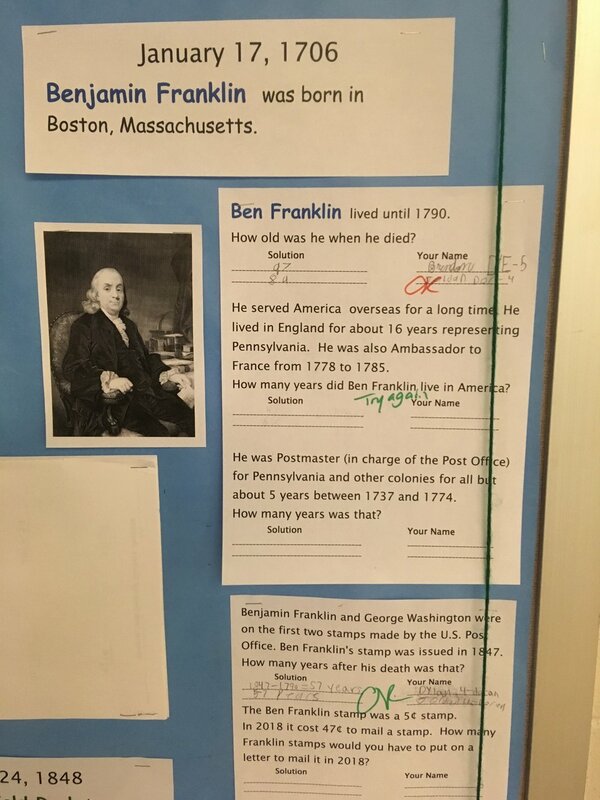 I look for events that I think students in Grades 3, 4, and 5 would find interesting and write questions for them, as shown. There are pencils taped to yarn which is suspended from the top of the frame, so students don't need to have a pencil with them to answer. I monitor the board every day and award a pencil to each student who first solves a problem correctly. I replace pages as the problems are solved. The Math is not rocket science -- this is not instruction, with a few exceptions. Most questions are assigned to specific grades to leave easier problems for younger students. The cost of the pencils is not great -- pencils by the gross are pretty cheap. And it's rare to have a pencil disappear. There are variations...the Current Events section always gets read. Sports can be the focus for lots of questions if your students are fans. I like wordplay and I think reading punny license plates is great reading and brain twister exercise. 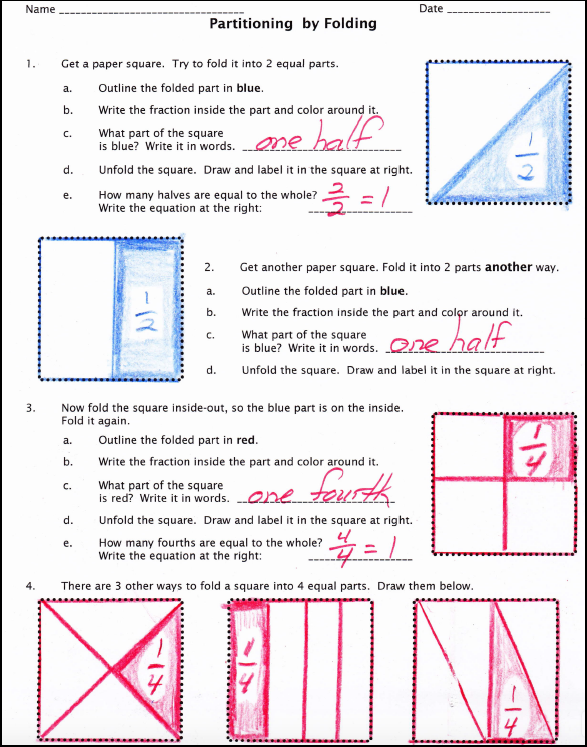 And sometimes I include a page that clarifies a math process -- for instance, measurement conversions, which students often get backwards at the start of school. I illustrate each event with one or two images that I find on the Internet, an allowable practice under the Classroom Exemption, since these are displayed only and not copied and handed out to students. On Denise Gaskins’ excellent site Let’s Play Math, I came across a mention of a “Super Rod,” in response to a question about how we would visually portray the number 10,000. The correspondent was talking about drawing blocks. A 1 is a small square, a 10 a 10-long rectangle, a 100 a 10 by 10 square, and a 1000 a 10 by 100 rectangle. It’s clumsy to draw 10,000 if you’re going to be consistent in the way you draw the different blocks. But it’s do-able in actual blocks. This box is from Uline, Model #S-4511. It’s 4” by 4” by 40”, or almost exactly 10 cm by 10 cm by 1 meter. I taped the ends, spray-painted it, then measured out the 10-cm intervals on the edges and drew the lines in permanent marker. By the way, if you teach 4th, 5th, or 6th grade and use Base 10 Blocks to represent decimals, as I do, this comes in handy. Since the 5th grade standards require decimals to thousandths, the 1 cm unit cube is .001, the 10 Rod .01, the 100 Flat .1, and the 1000 cube is 1. So this Super Rod becomes the number 10. I’ve made several of these and use them in 5th as well as 4th grade. The first player will always win even with that rule change, however, as long as the game ends with the first “three in a row.” So it doesn’t. Players continue playing. Each time a player makes a 3 in a row, he or she makes a tally mark on the appropriate line of the score sheet. When all 27 spaces are filled, the players count up their scores. It’s fairly common to see both players with 4 or 5 tallies in a game. This is a good exercise in transferring 2-dimensional perception into 3-dimensional space. For Xs, I use large Jacks and for Os, 2-centimeter cubes.